If you are looking for a tobacco free life we have the perfect answer for you with the Kangertech Subox Mini Starter Kit, which contains just about everything that you will need to sustain this. With this kit you can vape up to50w and at a resistance as low as 0.3ohms a great choice, add to that the 510 connection which makes it compatible with the majority of atomizers and clearomizers. The battery required is an 18650 battery which we do not include in the box, this battery will give you lots of vaping time and it can be charged by the USB cable which we have included. The kit includes the Kanger Subox Mini Box Mod, Kanger Subtank, a 0.5 ohm OCC head which is best for straight to lung inhales as well as a 1.5 ohm OCC head, bets for lung to mouth inhales, an RBA which will allow users to build their own coils and get a custom ohm resistance which will save you cash as well and the Delrin Drip Tip. The Kangertech is offered by us in a choice of either black or white, plus some extra parts as well. 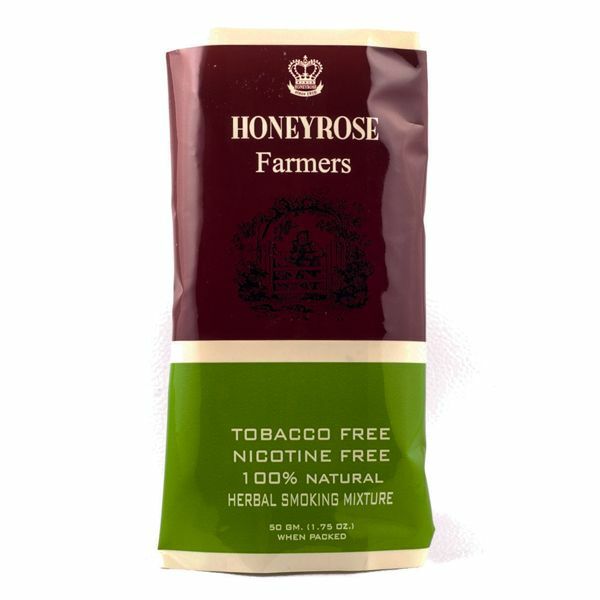 The Honeyrose herbal mixture is guaranteed entirely tobacco free, made entirely with natural herbs, including marshmallow, red clover and rose petals and is an aromatic blend of pure honey, apple juice and natural flavours. One of the great things about Honeyrose mixture is that it is entirely nicotine free and is perfect if you have stopped smoking tobacco, or are in the process of giving up. 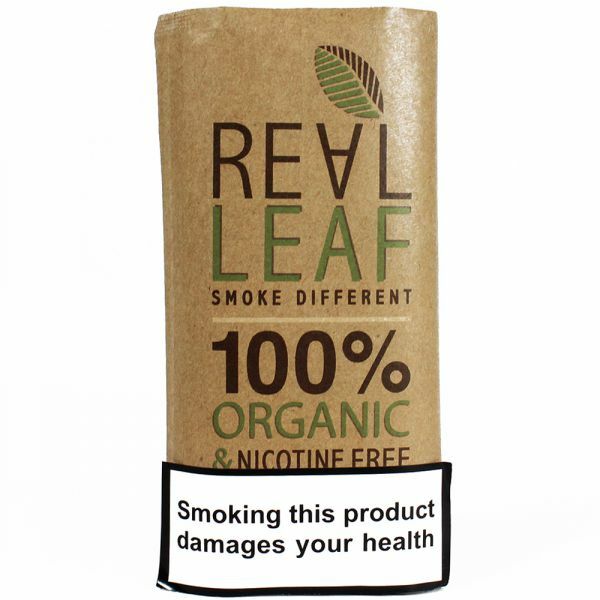 By using this herbal alternative you will find that it is completely non addictive but at the same time provides a wonderful smoke and by using this mixture, a great many people have succeeded in stopping smoking tobacco in as little as three weeks. Many ardent pipe smokers of forty years or more are now using this herbal mixture instead of their normal tobacco. They have found that that it is not only stopped their craving for nicotine related tobacco, but they have even cut down the amount previously smoked, a brilliant herbal substitute. The Honeyrose farmers honeyblend mixture can be described as being a product that is designed for the connoisseur market. It features the Honeyrose signature blend of aromatic herbs that has been matured in honey and apple juice to give it a sweet but not over powering smell and flavour. Why not try it for yourself; we are confident that you will not be disappointed, and if you do want to stop smoking regular tobacco, you can quit the natural way using this herbal mixture. Honeyrose is available as a 50g pack or in tailor made cigarettes. Quit the nicotine habit and relax with Tobakno which is a tasteful, spiritual mix of 5 different herbs that will give you a lightly stimulating and uplifting effect with the refreshing mix of herbs, without nicotine! This unique herbal blend consists of a mix of some of nature’s most peace invoking and calming herbs. These include Lavender, Damiana, Marshmallow Leaf, Mint and Uva Ursi. The size of a package Tobakno Tobacco Substitute is equal to the size of most packages of tobacco, and contains 15 grams of herb mix. The package has a double flap and is easily closed with a handy closing strip; in this way, the herbs stay constantly fresh. The taste of the mix of herbs is pleasantly soft and refreshing and resembles the taste of mild tobacco with a dash of mint, we are confident that you will find the effect is surprising and lightly relaxing, guaranteed to give a lift if you are feeling down. 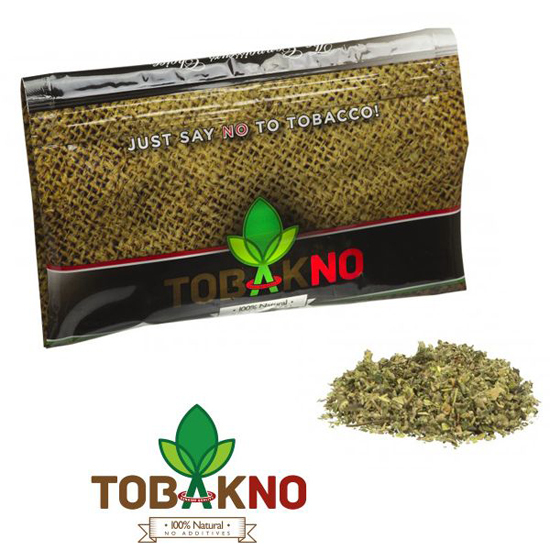 Tobakno is the ideal choice for anyone wishing to cut down on their addictive nicotine habit and the herbs burn and smoke well and uniformly if you smoke them in a Cone or when you prepare it as a cigarette yourself with a cigarette paper and a tip. The Tobakno mixture can also be smoked using a pipe if preferred, or in one of the many vaporizers. With Tobakno you have a good alternative to say no to tobacco. Pre-rolled herbal cigarettes – a great alternative to tobacco! If you have graduated to e cigarettes instead of smoking the real thing, why not alternate occasionally with one of our herbal tobacco products? The e-cigarette or vaporizer, will give you the hit of nicotine but we can guess that you will still be missing the feel and taste of a manufactured tobacco product. 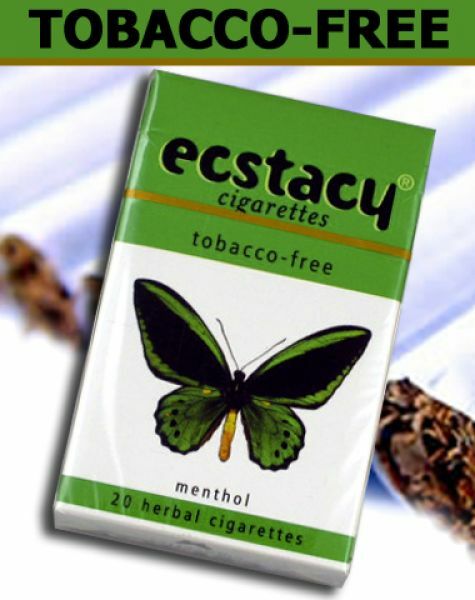 Our customers tell us that they are pleasantly surprised when they have tried our herbal alternatives and one of our most popular pre-rolled herbal cigarettes is the tobacco and nicotine free Ecstacy Menthol cigarette. If you are still a regular smoker of real cigarettes and would like to reduce of give them up completely, using the Ecstacy menthol and combining it with a vaporizer is sure to help you. The menthol flavour adds a refreshing edge to these herbal cigarettes these are completely tobacco and nicotine free, the small amount of menthol added just gives the smoke a touch of minty flavouring. Supplied in packs of twenty cigarettes, these are priced at just £4.99 a pack which in itself is a great saving on regular tobacco products. In addition to the Ecstacy menthol brand, we stock a wide range of other flavoured herbal cigarettes as well as many styles of rolling tobacco for those that prefer this style. The Silver Palm Leaf Pipe aka the Credit Card Pipe is an ideal travel pipe for those on the move that still want to enjoy their herbal blends. As the name suggests, this pipe is shaped like a credit card and wouldn’t look out of place in your wallet, but its piece de resistance is its built-in cooling system. The Silver Palm Leaf Pipe has a channel system cut into the base meaning that the smoke travel through this before it gets to your mouth, providing a cool and smooth smoke. The base of the pipe is held on with strong magnets, making it easy to disassemble and clean. The award-winning Silver Palm Leaf Pipe would make a great gift for any smoking enthusiast or a great travel companion for yourself. 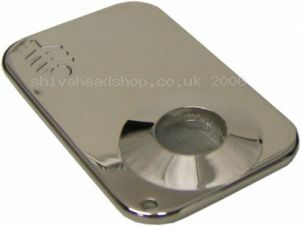 It is available now in a highly polished chrome finish for just £24.99. Check out Shiva onlines range of herbal blends and tobacco alternatives and start using your credit card pipe straight away. Amico Sweet Palm Wraps are flavoured blunts made from palm leafs; they come pre-rolled, have their own filter and each one comes with an ‘injector stick’ so that you can properly pack your chosen herbal blends for a great smoke. Available in a range of mouth-watering flavours including bourbon whiskey, vanilla, chocolate cake and Jamaican rum, Amico Sweet Palm Wraps give you a tasty smoke every time. Palm wraps are ideal to use with tobacco alternatives as they are 100% tobacco free, great if you are trying to cut down or quit smoking altogether. Amico Sweet Palm Wraps are available now from Shiva for just £0.99 each and if you buy 5 you get 1 free, sweet! 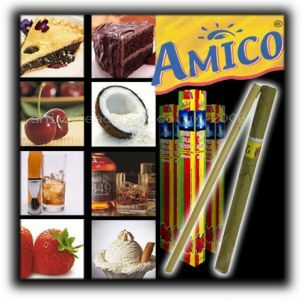 Try Amico Sweet Palm Wraps for a great smoke! Blunts have become very popular over the past few years because of their look and taste and one of the most popular brands of blunts are the Amico Sweet Palm Wraps. These blunts are pre-rolled meaning that all you have to do is fill it with your favourite smoking mixture, pack it down with the included poking stick, light and enjoy! The Amico Sweet Palm Wraps are slow burning and have an in-built filter to catch some of the harmful tar and to stop bits going into your mouth. Available in a range of exciting flavours including blueberry pie, chocolate cake, Jamaican rum and succulent strawberry, these blunts will get your taste buds going. Blunts are traditionally made with tobacco leaves, but as the name suggests the Amico Sweet Palm Wraps are made from palm leaves, great for using with tobacco alternatives if you are cutting down or trying to quit altogether. Amico Sweet Palm Wraps are 99p each and if you buy 5 you get 1 free, bargain! Roll Tray Gift Set – the perfect smoker’s gift! The Roll Tray Gift Set is a great gift for any smoking enthusiast and contains everything needed to roll the perfect cigarette. 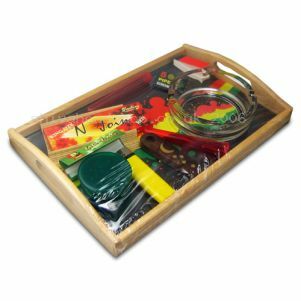 This smoking kit comes with a large rolling tray, ashtray, roaches, rolling papers, a herb grinder and a lighter. There is also a small wooden pipe and 5 pipe screens for when you don’t feel like rolling your own cigarettes. Please note that the Roll Tray Gift Set design may vary slightly from the picture but does contain all of the smoking accessories mentioned above. There is also a range of tobacco alternatives and herbal blends to choose from on the Shiva sight to finish your gift off in style.